A robust and stable running vest pack that carries more than you expect. I debated over the star rating as in many ways it is a 4 star product and I personally really like it so read on to see if it suits your needs. Grivel are best known for their crampons, ice tools and carabiners in the UK but alongside their metallurgical excellence they have for many years produced soft goods such as packs, harnesses and slings. They have also been a title sponsor for the Tor des Geants trail race and produced both running pack/vests and poles aimed at the trial runner. The Mountain Runner Comp (5ltr) along with its big brother the Mountain Runner (12ltr) was their first entry into the running vest market back in 2014. Currently the Mountain Runner is unchanged but Grivel seem to be in the process of updating their running vest lineup. As you would expect from Grivel there is an emphasis on strength and durability over lightweight, the Mountain runner Comp weighs in at a smidgen under 450g which is light for a pack but more than double the weight of many lightweight trail vests. Some of this weight is due to the use of more durable fabrics. The Mountain Runner Comp feels more pack like than garment like but it’s still comfy to wear against the skin and the materials breath well. More importantly it’s not going to rip when you overcook that rocky descent or go bush whacking through the gorse – unlike some of the more race orientated vest on the market. Alongside the durable fabrics Grivel have opted for an adjustable ‘one size fits all’ using sliding joint pull tab and velcro arrangement on the shoulders. This actually works very well and is rock solid once set with no creep or slippage. There are pros and cons to this approach. On the negative side you end up with a slightly bulkier and heavier vest pack. However it does mean you can dial in the fit, useful if you fall between sizes in some makes and you can also adjust to fit over winter kit, perhaps not so applicable to the smaller Mountain Runner Comp but some of Grivel’s larger vest packs would make excellent winter trail packs. Leg 4 of the Bob Graham – one (broken) pole stashed. Obviously another advantage is to the retailer with just one size to stock and it’s also easier for consumers to mail order. Storage wise you get three pockets on the back, one accessed by a vertical side zip that will take a bladder and two horizontal zipped pockets; a small one for keys etc. (I put my reading glasses in there) and a larger one that will take a jacket and light over-trousers. Externally on the back you have twin pole holders (only accessible by removing the pack and they will also double as ice axe holders) and a bungee system that will hold a jacket or running spikes as well as compressing the load with a tension system that can be snugged up at the shoulders whilst wearing the pack. The side panels include a zipped pocket on each side large enough for at least four bars a piece or a couple of bars and a compass and race map. On the shoulder straps there are twin bottle/flask holders. Rather than the slim elasticated slip bottle pockets these are the more traditional shaped affairs that will take up to a 600ml softflask or a rigid cyclist 600ml bidon. There is top cinch and small elasticated loop to secure either and you do need to use these to keep the contents secure with a softflask. Each bottle pocket has two elasticated slip pockets on the outside that will accommodate gels or bars. Beneath the bottle pockets are two small velcro flapped pockets that will take lip balm, salt tablets or a few hydro tabs. Higher up on the shoulders are a slip pocket with security velcro tab on the left that will just about accept small smartphone like the iPhone SE and on the right a small zipped pocket with an attached mini whistle. 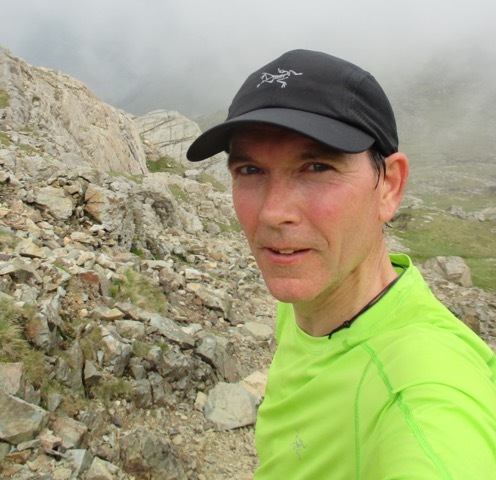 I’ve used the Grivel Mountain Runner Comp for all my longer mountain runs so far this summer including several recce’s of the Bob Graham 4th leg. With it being so hot and dry carrying sufficient water was a priority and being able to have two 600ml softflasks and even an additional 1.5ltr bladder if needed (many of the springs had dried up along the ridge routes in the Lakes) was very handy. I prefer the front mounted softflasks as it is easier to monitor how much fluid you’re consuming and easier/quicker to refill from springs as you don’t need to remove the pack. The Grivel Mountain Runner Comp easily accommodated all my needs for a 5 plus hour run including: food (six ChiaCharge bars and a couple of emergency Cliff Shots), drink in the form of two 600ml softflasks and spare SIS Go tablets, spare clothing (rain jacket or windproof, shell trousers, gloves and spare Buff), map, compass, reading glasses, bivibag, mini first aid kit, poles and iPhone). When it came to Kev’s BG attempt I was tempted to use bigger pack but found I could carry all of the above plus an additional 1.5 ltr bladder in the Mountain Runner Comp which I preferred for its stability and ‘on the go’ access to food, drink and map/compass. The stability and comfort when running with the Mountain Runner Comp were excellent and after two months of heavy use it shows little or no wear save a few white salt stains (sorry – yuck, but they did wash out!). There were a few minor niggles which perhaps reflect the age of the design. Firstly the bottle/flask holders were not as secure as more modern designs unless you used the additional loops however they are capable of taking a standard rigid cyclist bidon which makes them more versatile. The slip pocket on the shoulder strap is very tight for even a small form factor smart phone like an iPhone SE – this does make it secure but also a pain insert and remove – you would have no chance with a bigger phone. To be honest this pocket is ideal for a baseplate type compass which is likely the designer’s original intention. It would be nice to be able to stow poles without having to remove the vest either for when you’re on scrambling terrain and want both hands or for when precision navigation is required and you want to manipulate map and compass. This is not a huge issue when training but could be one of those additional faff factors when fatigued in a race. Overall this is a good pack well suited to climbers and mountaineers who run in the hills but it is looking a little dated compared to more modern offerings if you’re a pure trail runner. No way to stash poles on the go.